PARA UNA MEJOR EXPERIENCIA DE COMPRA FAVOR DE PREGUNTAR SIEMPRE POR DISPONIBILIDAD DEL PRODUCTO. TODOS NUESTROS PRODUCTOS SON IMPORTADOS Y ENVIADOS DESDE MÉXICO. SOMOS UNA EMPRESA RESPONSABLE Y COMPROMETIDA CON NUESTROS CLIENTES PARA LLEVAR LA MEJOR CALIDAD Y VARIEDAD DE PRODUCTOS IMPORTADOS A NUESTRO CLIENTE FINAL. Descripción: Have too much change in your pocket and dont know what to do with it? Save it in a decorative way Use this coin bank lid on any standard Mason jar. This lid measures 2" diameter with a slit in the top that will accept all of your spare change. This item does not include a jar. The lid will fit a standard Mason jar. Have too much change in your pocket and dont know what to do with it? Save it in a decorative way! 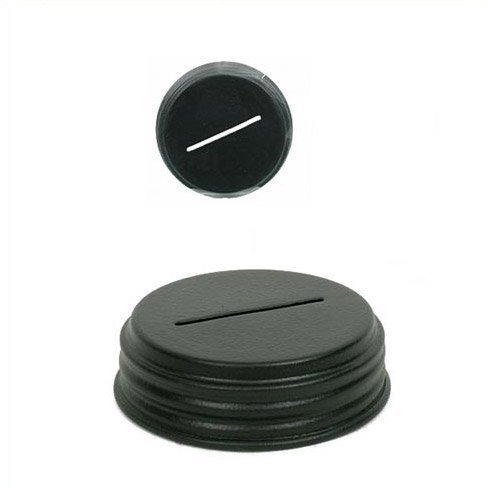 Use this coin bank lid on any standard Mason jar. This lid measures 2¾" diameter with a slit in the top that will accept all of your spare change. You will be saving money and your bank account will look good too! This item does not include a jar. The lid will fit a standard Mason jar. *VENDEMOS SOLO ARTÍCULOS NUEVOS Y DE MARCAS ORIGINALES. *TODOS NUESTROS PRODUCTOS TIENEN ENVIOS GRATIS. *CONFIANZA: SEGURIDAD EN TU PAGO TU DINERO ESTA SEGURO MERCADO PAGO NO LO LIBERA HASTA QUE TU RECIBAS TU COMPRA. *TE DAMOS LA SEGURIDAD DE 100% COMPRA PROTEGIDA. * OFRECEMOS 1 MES DE GARANTÍA EN TODOS NUESTROS PRODUCTOS NO PERECEDEROS CON DEFECTOS DE FABRICA O SI TU PRODUCTO NO ES LO QUE SE OFRECE EN ESTA PUBLICACION LO PUEDES REGRESAR SIN NINGÚN PROBLEMA! PARA REALIZAR TU COMPRA SIGUE ESTOS 3 SENCILLOS PASOS! 2. CONCRETA TU COMPRA CON EL MÉTODO DE PAGO DE TU PREFERENCIA QUE OFRECE MERCADO PAGO. 3. UNA VES REALIZADA TU COMPRA TE ENVIAREMOS TU PRODUCTO DENTRO DE 2 A 5 DÍAS HÁBILES A PARTIR DE QUE SU PAGO SE REFLEJE EN NUESTRA CUENTA DE MERCADO LIBRE PARA QUE TU PAQUETE NO PASE POR ADUANA NOSOTROS REALIZAMOS LA IMPORTACIÓN ANTES DE REALIZAR EL ENVÍO LA MAYORÍA DEL TIEMPO REALIZAMOS EL ENVIÓ EN 1 o 2 DÍAS HÁBILES.